Can I Eat Pork That Smells Bad if I Cook It Long Enough? How Long Does It Take for Pork to Spoil When Not Refrigerated? How Do I Tell If Pork Has Turned Bad? Can Pork Roast Be Pink in the Middle? Don't rely on color when checking for doneness. 1 Can I Eat Pork That Smells Bad if I Cook It Long Enough? 2 How Long Does It Take for Pork to Spoil When Not Refrigerated? 4 How Do I Tell If Pork Has Turned Bad? Cooking a pork roast longer than necessary or to a higher internal temperature than necessary in an effort to rid it of a pink middle, results in nothing more than an overdone piece of meat. Once the pork roast is overcooked, there is no way to get the juiciness and flavor of the meat back. Instead of relying on color to decide whether your pork roast is done, take its temperature. Temperature is the determining factor when it comes to checking a pork roast for doneness. It may be pink, but once the internal temperature hits 145 degrees Fahrenheit, it is fully cooked. Press a meat thermometer into the center of the pork roast to test the internal temperature. If the reading on the temperature gauge is less than 145 F, pop the pork roast back in the oven and recheck the temperature every 15 minutes or so. Cooking isn’t completely over until the pork roast has a chance to rest. The U.S. Department of Agriculture recommends allowing the pork roast three additional minutes to reach maximum internal temperatures before you dig in. During this time, the internal temperature of the meat continues to rise, or in some cases, remains constant. This gives the heat of cooking some additional time to kill any pathogens that may be lingering. The root of most of the confusion that surrounds pink pork is myoglobin -- a water-soluble protein found in muscle. When exposed to high heat, a chemical reaction occurs, resulting in red, purple and brown shades of myoglobin. Although the myoglobin color changes are subtle in pork, muscle that has a high pH protects the myoglobin from high heat, causing the meat to remain pink even when fully cooked. 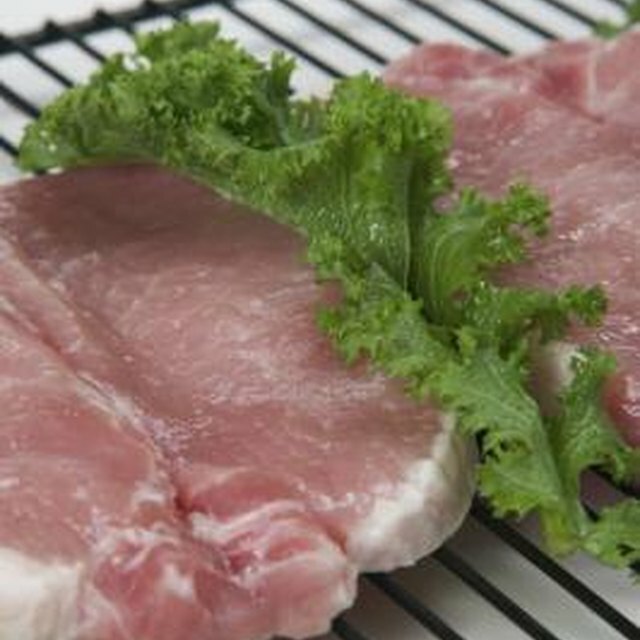 Undercooked pork roast may lead to serious foodborne illnesses if ingested. Even if the pork does not have a pink middle, it is dangerous to assume that a tan-white center is a sign that the meat is fully cooked. Trichinella spiralis, the parasite that causes trichinosis, along with Staphylococcus aureus and Escherichia coli are just a few of the parasites that are cause for concern. Thorough cooking, along with the recommended rest time, reduces your risk of illness. Should You Cook Raw Meat That's Gone Grey? Can Lamb Chops Be Pink in the Middle? What Are the Benefits of Topically Applied Coq10? 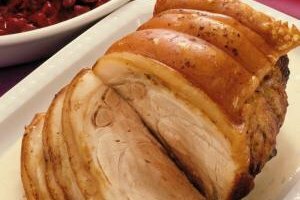 What Does It Mean to Score Roast Pork?